"In a world of instant gratification, clay teaches you to slow down. Some things are worth the wait and extra effort. The time from start to finish can be quite long - actively making the pot, drying times, and two kiln firings. Patience is key because if you rush any part of the process, all the work you have done could be lost ... One of my mantras is that 'Beyonce was not made in a day.'" How and did you start making pottery? I started making pottery in 1998 at a college course and fell in love instantly. This is not to say I was good at it at first because I was not. But I enjoyed it very much, from the start it was a great way for me to "de-stress" and clear my mind, focusing on creating something that was both beautiful and usable in everyday life. Year after year, building on my skills is what has gotten my work to the level that it is today, and with it, my love for the art has grown even more. My inspiration to start Off Your Rocker Pottery came from my two beautiful daughters. The thought of leaving my children with someone else all day while I go and sit at a desk in an office was something I could not do. I converted my basement in my home to my pottery studio. Complete with both a shipping area and photo staging area. This in-home studio makes it possible for me to make pottery and be with my children all day. Being my own boss also means I can set my own hours around preschool and sleep time. One of the best things is having my girls apart of what I do. They love to "help" me box up orders everyday and are even making their own pots already. I want my girls to go after their dreams in life, and I know the best way to teach them this is to go after my own. 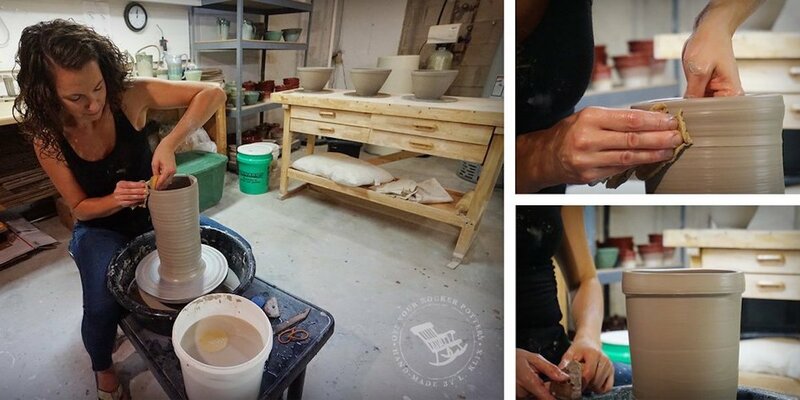 What is the biggest lesson that you have learned from making pottery? Working in clay and making pottery has so many lessons to teach. Heart break, patience, and surprise are just a few to name. Heartbreak comes in when a pot that you have worked so hard on does not turn out. Sometimes the glaze is not right, sometimes they crack during firing. These always occur at the very last step in the process, and there are a lot of steps in handmade pottery. You have to learn to not get attached to the material item but instead hold onto the lessons you learn. I tell myself I can always make another one. In a world of instant gratification, clay teaches you to slow down. Some things are worth the wait and extra effort. The time from start to finish can be quite long - actively making the pot, drying times, and two kiln firings. Patience is key because if you rush any part of the process, all the work you have done could be lost. And let's not forget the happy surprises life has to offer. Experimenting with clay and glazes and having a piece turn out better than you had expected is one of the best feelings. What is the key feture of your design? In my design it is crucial to blend both beauty and function. I make functional pottery - that is to say pottery which is intended for food use. Each piece must be user-friendly and enjoyable to use everyday. If it is not enjoyable to use, you lose a huge element that I am trying to achieve with my work. The look of the piece is just as important. We all love to look at and use beautiful things. I use a wonderful combination of clean lines and natural flowing curves that invite the user in. The biggest challenge of running an art-based business would have to be time. When selling handmade art, you need to handmake each and every piece that you sell. This task alone is very time consuming. Then you have a second full time job of running the business. Balancing the accounting books, paying sales tax, marketing, social media, shipping out product, ordering supplies, and I also write a blog to promote web traffic. I have learned to schedule things ahead of time, as well as organize my studio and clay work flow to have the most efficient use of my time. There are so many things I want to do with Off Your Rocker Pottery that I have to constantly remind myself that these things take time. One of my mantras is that "Beyonce was not made in a day." Final word you would like to share with our audience who are passionate with art/design. At the end of the day, you need to make sure you do what makes you happy and what you are passionate about. Sometimes the road can be bumpy, winding, and uphill but it is a path worth taking. The challenging roads always lead to the best views. Off Your Rocker Pottery is Lindsay Klix's love affair with clay that has grown to a small shop of handmade pottery. Each piece is made without the use of molds or jigs. With focus on durability, design and function on every piece created, Lindsay gets her inspiration from nature and architecture, combining clean lines with natural cruves.